CUBA STANDARD — Following the approval of U.S. scheduled flights to provincial airports in June, the U.S. Department of Transportation on July 7 “tentatively approved” eight airlines to fly to Havana from 10 U.S. airports. If all flights were cleared for take-off, the bidding airlines would face a major challenge to fill seats — particularly to provincial airports — as total capacity represents nearly four times the actual number of U.S. visitors to Cuba in 2015. 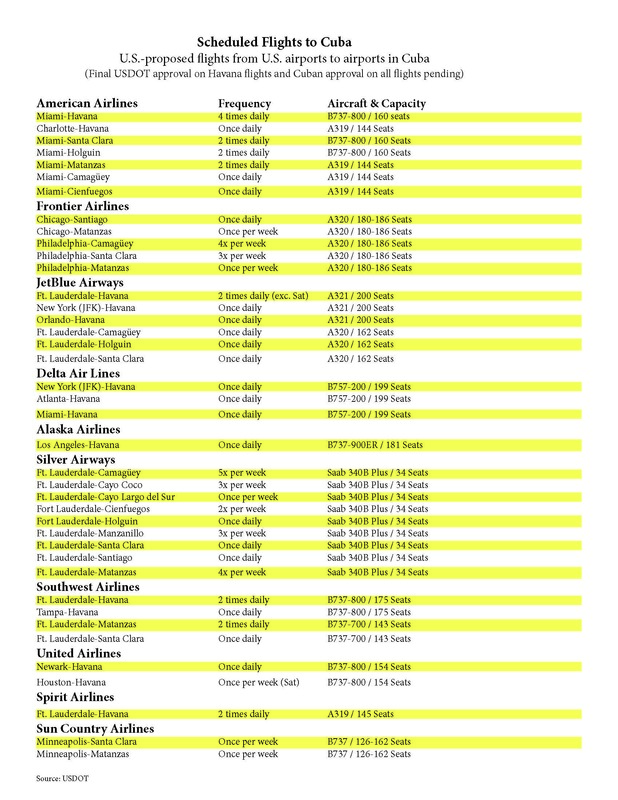 Pending airline appeals due July 22, the U.S. Transportation Department will grant final approvals “sometime later this summer”, according to a USDOT fact sheet. From the final determination, airlines will have 90 days to begin operations; some airlines have said they expect to start flying to Cuba as early as September. U.S.-approved flights would offer 2.2 million seats per year, nearly four times the estimated 550,000 U.S. citizens and residents who traveled to Cuba in 2015; just American Airlines was approved to provide 730,000 annual seats. 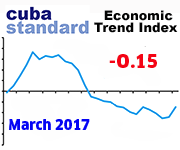 To be sure, non-Cuban American U.S. travel to the island rose a hefty 83.5% in the first half of this year, according to Cuban authorities. Even so, absent a major boost such as U.S. Congress lifting the tourism ban, the airlines would have to cope with years of overcapacity until the seat numbers will match actual demand. 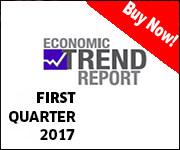 However, in the current political constellation, Congress seems reticent to follow the lead of the White House. In June, the Cuban embassy did not grant visa to a Congressional delegation, made up of House Homeland Security Committee Chairman Michael McCaul (R-Tx. ), John Katko (R-N.Y.), Martha McSally (R-Az. ), Richard Hudson (R-N.C.) and Henry Cuellar (D-Tx. 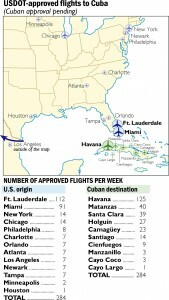 ), that planned to observe security measures at Cuban airports. In response, four Republican lawmakers have banded together, saying that scheduled flights should not be approved. Not surprisingly, even before they are authorized to sell tickets, at least two U.S. airlines have announced discounts unheard of during the charter-only era, to fill the seats of inaugural flights. American Airlines says it offers flights to provincial airports starting at $262; meanwhile, regional carrier Silver Airways — which was granted approval for an ambitious schedule to provincial airports — announced first a 33% discount, and then a buy-one-get-one-free ticket deal. The Transportation Department approvals are based on a non-binding arrangement between Washington and Havana in February, under which Cuba grants 90 daily slots at provincial airports and 20 at José Martí International Airport in Havana. 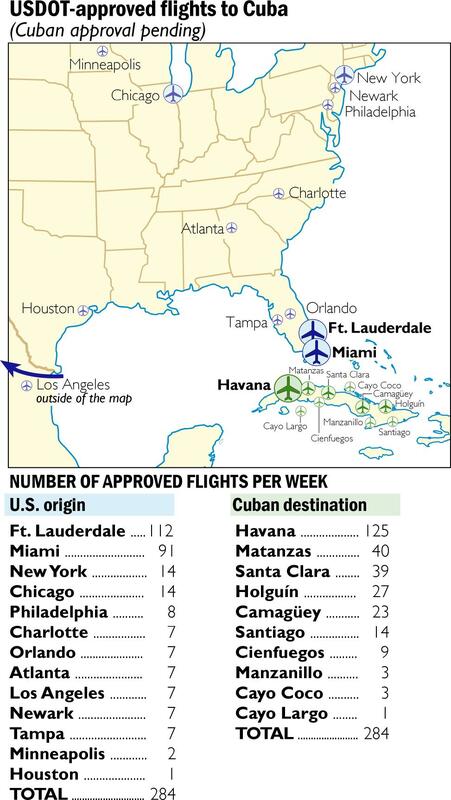 While the USDOT approved practically all airline bids for flights to provincial airports, it had to reject two out of three flight applications to coveted Havana, the No. 1 destination for both tourism and business. 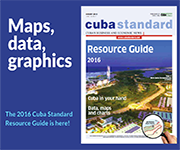 A dozen airlines had applied for nearly 60 daily flights to Havana International Airport. 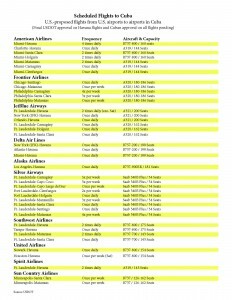 For Havana flights, USDOT approved American Airlines, JetBlue, Delta, Southwest, Spirit, United, and Alaska Air flights from Atlanta, Charlotte, Fort Lauderdale, Houston, Los Angeles, Miami, Newark, New York City, Orlando, and Tampa. “DOT’s proposal allocates nonstop Havana service to areas of substantial Cuban-American population, as well as to important aviation hub cities,” the press release explained. One week later, USDOT granted FedEx the rights to operate cargo service between Miami and Matanzas. The company had initially applied to fly Miami-Havana- Mérida-Miami using large 757-200F jets, but retracted its bid and submitted the Matanzas proposal instead, planning for five weekly flights on a single-engine Cessna 208. The Juan Gualberto Gómez Airport (VRA) in Matanzas — an hour’s drive east of Havana — is Cuba’s second-busiest airport, also serving the Varadero beach resort. Russia has proposed to build a cargo-only airport on an airbase southwest of Havana, serving the capital and the Mariel Economic Development Zone. This entry was posted on Sunday, July 17th, 2016 at 11:54 pm	and is filed under Top Stories. You can follow any responses to this entry through the RSS 2.0 feed. Both comments and pings are currently closed.